My husband and I are thrilled that we chose Let's Party L.A.'s DJ services for our July 2018 wedding at Descanso Gardens in La Canada-Flintridge, CA. Our DJ, Bryan, was extremely personable, courteous, professional, knowledgeable about music and the specifics of venues and setup, responsive, flexible, and prepared, and his services were extremely reasonably priced. He happily met with us ahead of time to come up with a wedding music list that really reflected who my husband and I are and also catered to the musical tastes of our family and friends. Everything about the music at our wedding was perfect, from the sound system that Bryan brought and set up; to his classy announcements of the first dance, toasts, etc. ; to a music stand he provided for the ceremony and lights he provided for the dance floor; to the light jazz set list for our wedding dinner; to the awesome dance music that he played later on. Our friends and family were dancing and having an amazing time until the very end of the night thanks to Bryan, and we got SO many compliments from our guests about how amazing our DJ was. We definitely recommend Let's Party L.A. to anyone and everyone! We have been to a lot of weddings, and no other DJ we have ever seen has even approximated Bryan's level of professionalism and awesomeness. Thanks, Bryan and Let's Party L.A., for helping us make an already magical day absolutely the best day of our lives! Thank you so much Anne! You & Mark had a beautiful wedding. And you were a stunning bride. :). Truly appreciate the kind words. We chose Let’s Party LA after interviewing many DJs for our wedding and we are so happy we did. Bryan is amazing to work with. He thinks of everything and created the exact atmosphere we were looking for. We had an initial FaceTime interview it was during that call that we realized Bryan was the DJ we wanted. He was kind and thoughtful. He didn’t pressure us into any extras and asked us important questions so he could better understand what we needed and were looking for. We met a few more times in person and Bryan even asked to see the venue before the wedding so he could be prepared. On the wedding day itself Bryan was super professional and worked well with all our vendors especially our wedding planner. Bryan is skillful at being able to keep the party going for all ages. Bryan had all equipment needed to make our wedding special, lights and sound and he even took care of the projector and screen for a slideshow. We are so happy we chose Bryan - Let’s Party LA and we would highly recommend him for all your party events. Also, Bryan surprised us and played our favorite song during our first look!! We were in tears of joy!!! There are no words to describe just how amazing Bryan is. First of all, not only is he a first rate DJ he is an outstanding MC. He takes the time to get to know his clients, their music taste, overall style/vibe & makes sure that his performance is a match for that. He did such an outstanding job at my friends wedding I had to hire him to do ours. And he was equally amazing. We absolutely love Bryan & highly recommend him! What can we say about Bryan? Well he is best DJ in Southern California!!! We heard so many good things about him that we begged him to DJ our wedding in San Diego. We chatted on the phone and hit it off and he agreed to not only drive down from LA for wedding, but also a week before during walk through with our other vendors. His set up was spot on, his music fueled a raging dancing party, and he emceed a great party overall. We cannot recommend Bryan enough. Best DJ! Bryan was great to work with! We had a couple meetings ahead of our event and he really listened to what we were trying to accomplish, had great suggestions and was super responsive and flexible to work with through planning all the way through the last dance. We had multiple generations in our crowd and our music tastes are all over the place but Bryan worked it all in everyone talked about how much fun they had. Thank you Bryan for helping us create our perfect wedding! Bryan was awesome!! He was responsive, helpful and professional. 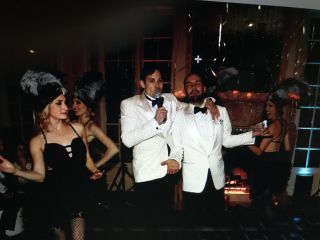 He fit into our Gatsby Party exceptionally well. The music and lighting were fantastic. Highly recommend him. Thanks Joe! 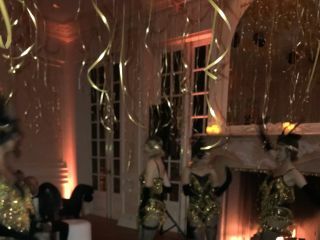 I think the Gatsby party goes on my all-time favorites list of parties I’ve DJ’d! The performances from the bling divas were amazing and I love how friendly all of your friends and family were. The fact that everyone dressed up in theme made it that much more exhilarating. What a great night! Thanks. We absolutely LOVED having Bryan for our wedding DJ- he was so fun to work with, professional, helpful and collaborative, timely, and responsive. His attention to detail, adherence to what we wanted and original suggestions and experience made it so easy and enjoyable to work together and I STRONGLY recommend booking his services!!! Bryan was fantastic to work with prior to the wedding. He spent hours with us going over song choices. He went over and above. The day of the wedding he was fantastic. Our guests raved about the music. He coordinated with my other vendors and was so easy to work with. Everyone was dancing the whole night! We received outstanding feedback on the cocktail hour music in which a few guests wanted a copy of the playlist. I highly recommend Bryan as your wedding or event digit !! Thank you so much Cammy! It's not everyday I get to DJ on the 18th hole of a golf course. 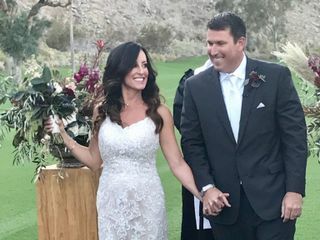 Loved your Palm Springs wedding! Loved all your music requests and truly enjoyed you & your friends/family rocking it out on the dance floor. I hope you and Bill enjoy the rest of your lives together! You guys make an amazing couple and loved getting to meet your kids as well as family & friends! And you made a beautiful couple - love the pics! We cannot say enough about how amazing Bryan is!! From day one, he was so fun and easy to work with. Everything we wanted, he made happen! We have had so many compliments on how great our DJ was, to the variety of the music selection, to the light up LED rings, all the way to the conga line (which we all were obsessed with!!) Bryan, you are absolutely incredible and can't wait to see you at my sisters wedding next year!! Thanks so much Erin!!! Loved DJ'ing your wedding! You & Khalen make a beautiful couple and I can't wait to see the pictures!!! Such a beautiful venue as well. Really enjoyed celebrating with you both and loved watching you guys rock it on the dance floor! And the dinosaurs were off the hook. lol Looking forward to seeing you both at your sister's wedding. If you’re looking for a DJ with enthusiasm, professionalism, integrity, heart and AMAZING ABILITIES, then Bryan is your man! We were looking for a DJ for our wedding, and Bryan was recommended to us. As soon as we met Bryan, we knew right away that we wanted to work with him. He’s organized and experienced, TALENTED, and so much fun to be around! During the planning process, Bryan was attentive and available to answer all our questions. He gave us song recommendations, helped us pick out the perfect songs for key moments in our wedding, and he made sure we had all our music for the day mapped out. Bryan really made us feel confident that he would seamlessly maintain the flow of our wedding day as emcee, as well as keep the dance floor full during the reception, and he absolutely delivered on that! As emcee, Bryan’s presence enhanced the celebration as he masterfully guided us through the different elements of our wedding- from our grand entrance, to our first dance, to the toasts- he has a brilliant way of letting guests know what to expect and making everyone feel included in the party. When it was time to dance, everyone poured onto the dance floor! Bryan kept the perfect songs coming, one after another. 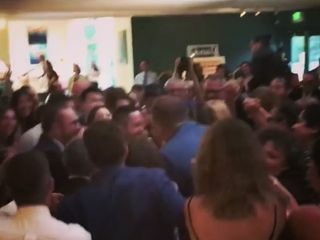 The dance floor was literally filled until the very end of the wedding. My wife and I had THE BEST time! Thank you, Bryan! We are so grateful for you! I cannot recommend “Let’s Party LA” highly enough!!! From the very beginning, Bryan went above and beyond to make sure that our day went perfectly. He was always accessible and responded to emails/calls/texts immediately. 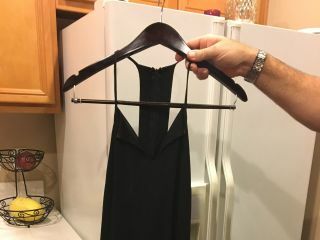 My wife and I had some bizarre ideas for our wedding that we threw at him but he was open and willing to try anything. He remains completely collaborative and eager to work in all specific details you might have in mind. And if you have no idea what you want, have no fear. He will keep your event running seamlessly and will have your guests up dancing and singing with ease. Most importantly, he is just a great, endlessly positive guy that you absolutely want on your wedding team. Do yourself a favor and go with “Let’s Party LA”. We hope that it’s the best decision you make for your wedding because it definitely was for us. Thanks so much Nick!!! Truly enjoyed DJ'ing and MC'ing your wedding. You and Haley make a beautiful couple. It's not everyday I get to play Singin' in the Rain during a wedding processional & 50's/60's Do-wop for the reception. Such a fun and romantic wedding at the winery! Loved all your friends & family as well. The best! Bryan was referred to me by a close friend and usually I'm worried about that because I'm type A and like to do crazy research and vetting so we still met with another DJ first, but when we met Bryan, we just clicked and was someone we wanted at our wedding! He's so nice, professional, really gets you and listens and makes everything easy and stress free and even did our lighting, which looked fantastic and I recommend getting, because it made a huge difference to the atmosphere and decor. Everyone loved him, he played everything we asked and kept everyone dancing all night. He made our special day so memorable and was just great to have there. I would recommend him to anyone and will be hiring him for other events as needed. Bryan was our DJ for our wedding last year and my wife and I couldn't be happier with the job he did. We were a little unorganized and not prepared as so many people are with wedding planning. He stepped up and help us make our special day run smoothly and sound amazing. I would work with Bryan again any time. Thanks so much Max!!! I truly enjoyed DJ'ing for you & Cate. Everything about it was very special and unique. Loved the Houdini Mansion - so cool!!! And the New Orleans jazz band and 'Second Line' with the napkins was so much fun. Such a fun and awesome night - thanks for having me. We hired Bryan to DJ our wedding at Saddlerock Ranch in May and we're so happy that we decided to go with him! He is such an awesome person and was so easy going and professional throughout the whole process. He came to our neighborhood a month or so before the wedding to go over all of the pertinent details with us and was very thorough in making sure he had our preferences for each part of the wedding day. He not only had a set-up for the reception but also one for the ceremony. We already had a difficult venue for vendors to set up at and at the last minute we had to change plans and have our reception in a tent in a different spot than was originally planned for. He had no problem making the adjustments and was so gracious. We had an Indian ceremony and he totally followed through on all of our requests for the songs that needed to be played during the ceremony. We've had family members who said that the DJs at their wedding didn't actually play the music that they had requested, but Bryan totally delivered on the genres that we requested and made great picks for songs! He even went a half hour over his contracted time because our whole reception was running behind schedule. He's just so awesome! Ellen- you are so kindhearted! Thank you for the wonderful review. It was such a pleasure to DJ your wedding! You and Sashi are an incredible couple and I foresee I long, happy marriage! First and foremost, our wedding would not have been as amazing as it was if it weren't for Bryan and the way he coordinated our playlist as well as his awesome mic skills. Bryan went above and beyond for our wedding and highly recommend him. You won't be at all disappointed. Bryan was great! My husband and I were pretty overwhelmed with the wedding planning by the time it came down to choosing music for our event. Bryan steered us in the right direction. He offered several ideas for both our ceremony and reception, gave us honest feedback when we sent him our own suggestions, and emailed us a slew of links to songs he thought would work well with our style. Come wedding day, he did not disappoint. He helped our coordinator to keep things moving ahead according to our timeline and got our guests up and having a great time throughout the night. Bryan is a hard worker and a genuinely nice guy! Bryan is not only a fantastic DJ, but he also was helpful in our overall planning of the event. You really can't find a better wedding DJ in LA!!!!! Thanks Bryan! There aren't enough words to describe how much we loved Bryan. He is so talented. Thanks to him our wedding was an absolute blast. The thing that makes him stand out from the rest is that with him you aren't just getting a DJ, you're also getting a planner. His ability to plan the days event from start to finish was truly amazing and his execution... flawless. It was as if he was the actual wedding planner. And then the music... Sooo Good! He took all of our musical input and executed with perfect timing. For a DJ the ability to read a crowd is key and he nailed. We're so very grateful that he was a part of our special day. We'll cherish the memories forever. Thanks Bryan!! Bryan was awesome. He was very organized and was the one pushing US to make sure we have all of our songs selected as soon as possible. He sent us recommendations, and cut the songs to appropriate length (and shared them ahead of time) for the dances, and intros. Bryan DJ'd my wedding a couple of weeks ago and let me tell you, if I could, I would give him a hundred stars!! We partied and danced the night away! Bryan took both my husband and I's different styles with our guest requests and created the smoothest blend that kept everyone happy and comfortable. His vast experience in the wedding industry came in handy when I wasn't getting what I needed from my wedding planner and he stepped up and made sure not only the music portion was taken care of but that everything else went smoothly. I could go on and on about Bryan, I wont for your sake.. but I will leave you with this. My wedding was magical, it was exactly what I hoped for and more, it really was the best day of my life, and I will forever be grateful to Bryan for playing such a huge part in it! Bryan is amazing! 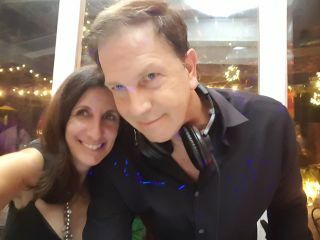 He did great DJing our wedding, he played all the right songs at all the right times! People were dancing the entire time. We love him! Would definitely recommend for any event! Bryan is the best DJ I've ever seen at any event. He was incredibly easy to communicate with and has the best energy. 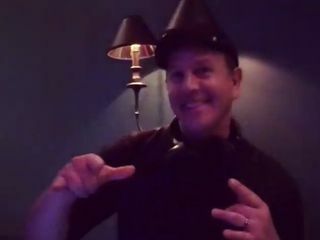 A lot of our guests commented on how much they loved the music and how Bryan was dancing while he was DJing....it made the atmosphere even better. He's also one of the nicest people in the world...we both absolutely adore him. There is no reason to think about any other DJ....Bryan is your guy! What can I say? I've known Bryan forever and there was no one else I would have trusted to DJ our wedding. The music the entire night was fantastic--which included a dinner set with songs picked by us--and even he took (surprisingly reasonable!) requests from our drunk family members! Most importantly (and probably underrated/unnoticed by most) was that the PA system sounded fantastic from start to finish--which I'm sure can be tricky for outdoor ceremonies like ours. We could not have been happier with Bryan being such an integral part of our wedding. So much love!